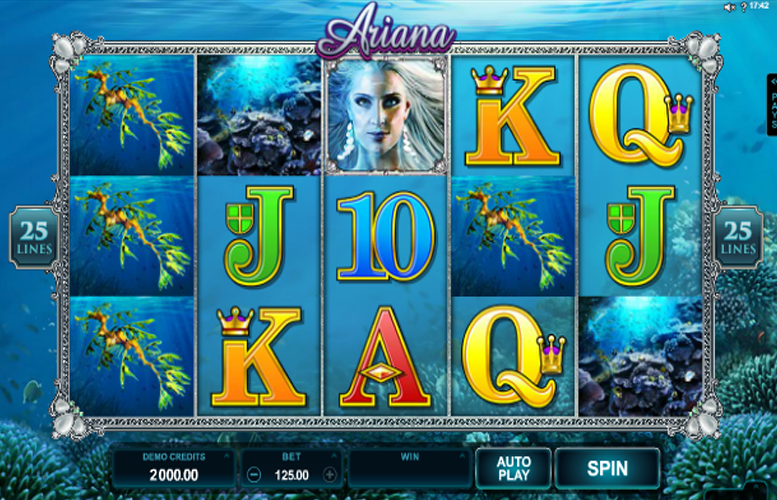 Ariana is a five reel, three row and 25 payline slot game from Microgaming, which invites players into a semi-mythical underwater realm. 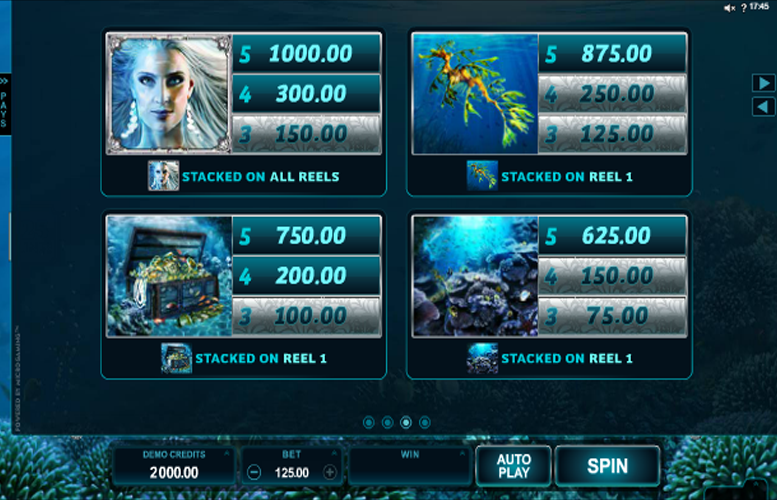 The title character of the game is a rather beguiling mermaid and the top jackpot of 30,000 coins, which can be won during free spins, is equally attractive. As well as those free spins, Ariana also includes an expanding symbols feature which helps to impressively boost payouts. A lack of any side game or bonus round, however, is a little disappointing as is the lack of any narrative or plot to the game. Players will feel like they’re really under the waves, though, thanks to Ariana’s fun, underwater themed graphics. Free spins add a nice extra dimension to gameplay and also give players the chance to win a very tasty jackpot of 30,000 coins. Graphics are well-designed and attractively implemented to give the game a pleasing look and to really create an underwater feel. Stacked symbols on the first reel can trigger an expanding symbol feature which makes valuable payline jackpots far easier to achieve. The game has a nice theme but is entirely lacking a plot or narrative. Aside from free spins and the expanding symbols, Ariana is a little light on additional gameplay features. There is no bonus round and no side games of any kind. Ariana does not include a bonus game per se but its gameplay does include a handy expanding symbols feature. The slot’s higher paying symbols can sometimes appear stacked on the first reel and if they do, all matching symbols on the other reels will then expand to cover their whole reel. That makes it far more likely for some of the game’s most valuable symbol combinations to line up along multiple paylines at once. 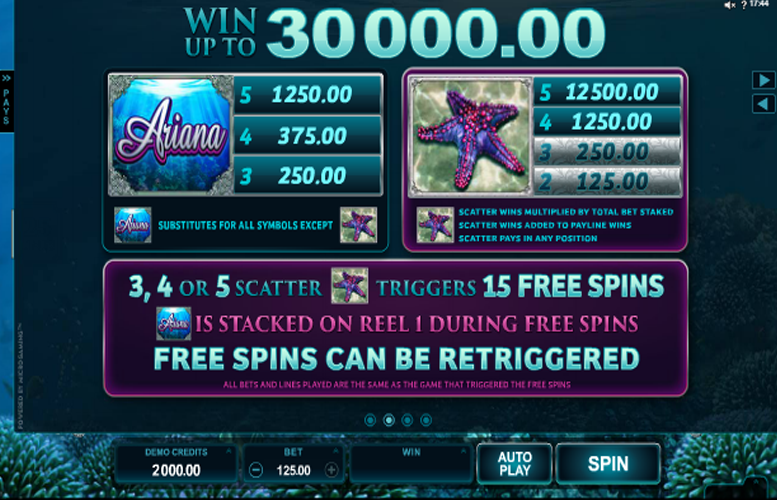 The Ariana scatter symbol shows off an image of a glittering starfish and if three or more appear anywhere on the reels, 15 free spins are triggered. A further set of 15 can then also be retriggered if three or more scatters appear while the original free spins are being played. What’s more, five scatters appearing anywhere on the reels at one time also results in a 10,000 coin payout. 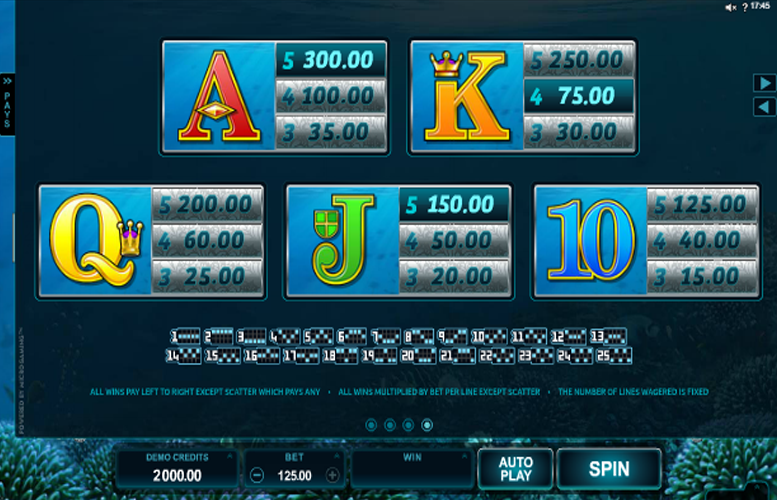 Like most slot games, Ariana’s reels include a collection of standard symbols which payout at a lower level than the higher value, nautical themed symbols we discussed earlier. Those symbols take their inspiration from playing cards, and display the 10, J, Q, K and A symbols associated with cards toward the top of a standard deck. The exact payouts resulting from combinations involving those symbols range from around ten coins to 100 coins and are outlined in the slot’s paytable. Ariana slot game players always have 25 fixed paylines along which winning symbol combinations can align. Whilst they can’t change the number of paylines, they do have a wide range of choices when it comes to how much they wish to bet per line. The minimum line bet for the game stands at just 1p, whilst the maximum is £5 and there are a good number of other alternatives in between. That means that the minimum bet per spin possible when playing Ariana is just 25p, whereas the maximum possible is a much higher £125. Ariana is a slot game which is likely to appeal most to those players who enjoy attractive games with simple, straightforward gameplay. The slot’s underwater theme is well supported by attractive graphics and a calm soundtrack but could have been more effective if a little narrative or plot was introduced. In terms of gameplay, Ariana is a little lacking in additional features, given that there is no second screen bonus round or side game. The slot’s free spins and expanding symbols feature, however, do help to add a little bit extra to the gameplay and to boost what are very reasonably sized payouts. All in all, then, the slot is probably one which best suits those players who like to give themselves a chance of winning big without having to pay too much attention to what they’re doing. This game has a rating of 3 / 5 with 420 total reviews by the users.